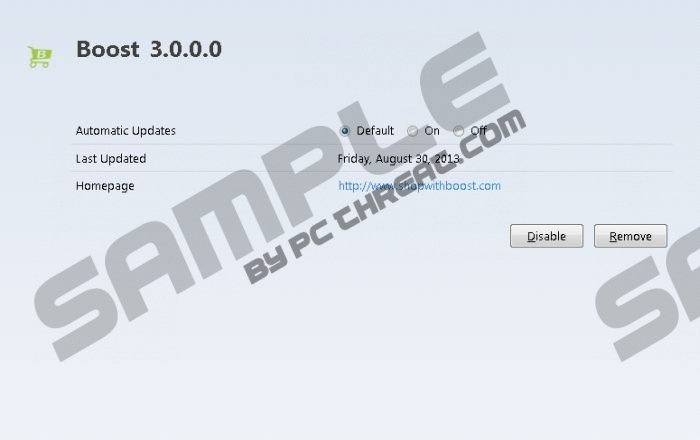 It is essential you run only secure and reliable applications on your operating system, and Shop with Boost is considered to be one suspicious browser extension. Malware researchers who have analyzed this plugin by Verti Technology Group, Inc. have discovered that it actually is an advertisement supported program, and this means that it is followed by various pop-up offers and advertisements. Needless to say, computer users who download the program from shopwithboost.com should expect this activity because the extension is promoted as a tool which is meant to produce saving deals and coupons. Unfortunately, some computer users may download the application accidentally when installing bundled software. Either way, we can help you remove Shop with Boost. The web is filled with advertisement supported programs which can flood your browsers with random ads, including PricePeep, Sharp-savings or BestSaveForYou. Even though most advertisement supported programs have official representative pages, they are often promoted by third parties as well. Authentic, reliable tools are not promoted by potentially unreliable parties who can link software to other suspicious software. Unfortunately, in most cases advertisement supported programs are distributed in this manner because they serve third parties and their potentially unreliable ads. Shop with Boost ads could be presented by unreliable parties as well, which is why clicking on them is not recommended. The manual removal instructions below will help you delete Shop with Boost from the computer and the infected web browsers. Note that you may need to delete other malicious programs which are quite possibly running on your computer. Authentic security software can remove hidden or camouflaged malware and shield the operating system against other dangerous threats, which is why we recommend installing this software onto the operating system without any hesitation. Open the Start menu by clicking the button on the left of the Task Bar. Find the unwanted application, then click it and select Remove. Navigate to the left of the Task Bar and click the Start icon. In the opened menu select Control Panel and then choose Uninstall a program. Locate the program you wish to delete, right-click it and then select Uninstall. Select All apps, then click Control Panel and finally move to Uninstall a program. Quick & tested solution for Shop with Boost removal.